Shop ModLi for modest swimwear for women and enjoy the sun in style. Cute modest bathing suits with skirts are hard to come by, so make sure you check out ModLi’s full selection of modest swimwear online before taking the family to the beach. We know modesty can be hard when you’re headed to the pool, so we want you feeling comfortable and beautiful. Whether you’re getting used to a mommy body, dressing conservatively for religious reasons, or love our patterns so much - we want to help you! Modest swimwear doesn’t have to be boring! Our swim sets come in many patterns and sizes, and styles on end! Cute modest swimwear with sleeves, with skirts, with leggings, and even full coverage bathing suits. If you don’t find the modest swimwear looking for, let us know! 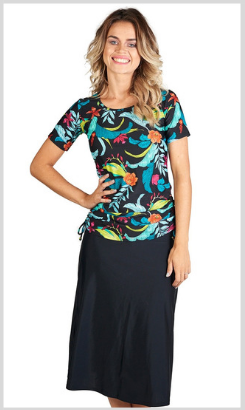 From cute swim bottoms to plus size modest swimwear to swim dresses and more, ModLi’s full range of modest clothing will help you dress for every occasion.